If you go down to Google's front page, you're sure of a big surprise ! Little Touches Details Club going cheek to cheek with you know who. 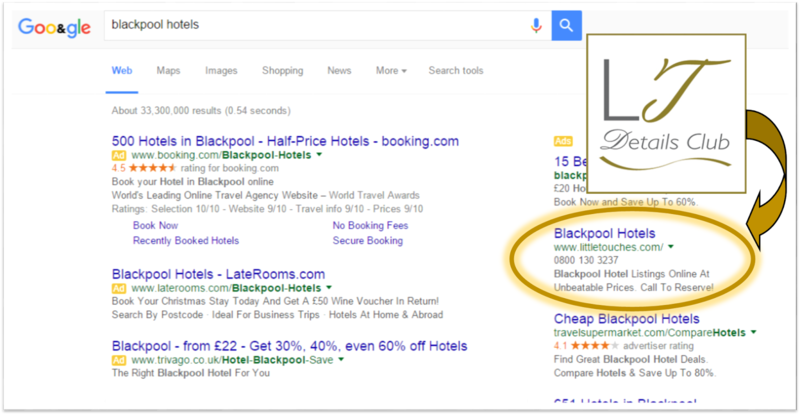 Call it what you wish: a competition sandwich, a side order of them and us, but we are there, fair and square, in the Page 1 glare of any him or her that happens to stumble upon the search results for the term "Blackpool hotels." Sceptics may say "well you will be if you are paying for it," and they would of course be right. 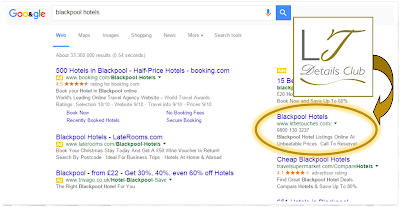 We are engaging in a comprehensive Google AdWords campaign to put heads on Blackpool pillows on behalf of hard-working hoteliers. But we don't just want to do it for Blackpool...we want to do it for every seaside resort, country retreat and city escape destination in all four corners of the United Kingdom and beyond. OK, so the "and beyond" phrase has become somewhat cliched in business blogs, plans and proposals, but regardless of that fact we will chase after YOUR RESORT/TOWN/CITY/VILLAGE + the word "hotels" on Google AdWords as soon as our golden rule per destination has been achieved. I'm throwing down the gauntlet to Southport to rally the troops and join The Leicester on our travel site. I wish for Llandudno to give each of their neighbours a nudge so that we have a B&B, Guest House or Hotel a stones throw from the Great Orme and a cute collection on Craig Y Don Parade. Lets have The Lakes ensure that regardless of their longitude or latitude they are listed and Scarborough's finest sensationally securing their spot. In the words of Shakira, whenever, wherever, we're meant to be together...on Little Touches Details Club.